I no longer need to know it all (why things happen, what they mean…that’s God’s job), but I do value the review of my experiences (and my lessons) to discern what God might be teaching me, or what I need to learn. I’ve been hitting it hard lately to have my mettle tested…to confirm what I’m made of. I am fierce and fragile, but also sheltered and treasured. I was drawn to Esther because life’s throttling lately reminded me, despite what’s happening in my life, I have favor before the King. God truly placed you in my life for a purpose. I know that God’s favor is upon you. Be blessed. Sometimes the blessing you’re about to receive has been waiting for you to be ready. Esther was fierce and fragile. I can only imagine that this season in my life is about being ready. So, it looks like I’m back in training, for God’s next big thing. As I get started, I’m re-reading a message I wrote myself as an encouraging reminder. …this is a lot to live up to. I am reminded, over, and over, how very full my life is. I am again reminded that even when life gets particularly rough, there is comfort in that in an imperfect world, a perfect God loves us, and abides with us, through all things. And despite all the toughest things I have to face and all the answers to all the questions I never have in time, I clearly have been granted an abundant life. 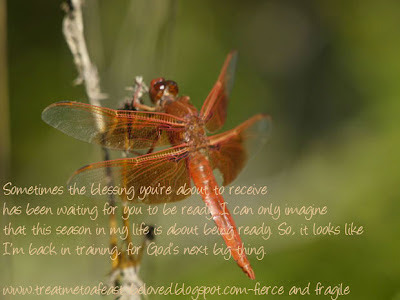 Fierce and fragile, but ready to walk in the favor for which I was created. It’s almost time, and all of what has gone before suggests that the after is going to be extraordinary. Further evidence that God is good.